Heat oven to 350ºF. Line 13x9-inch pan with foil; spray with nonstick cooking spray. In small bowl, mix crushed cereal and melted butter with fork. Press mixture in bottom of pan. Refrigerate while continuing with recipe. In small bowl, mix whipping cream and coffee granules with fork until coffee is dissolved; set aside. In large bowl, beat cream cheese with electric mixer on medium speed 2 to 3 minutes, scraping bowl occasionally, until smooth and creamy. On low speed, beat in sugar, eggs and coffee mixture, about 30 seconds. Beat on medium speed about 2 minutes longer or until ingredients are well blended. Using rubber spatula, spread cream cheese filling over crust. Bake 25 to 35 minutes or until centre is set. Cool 30 minutes. 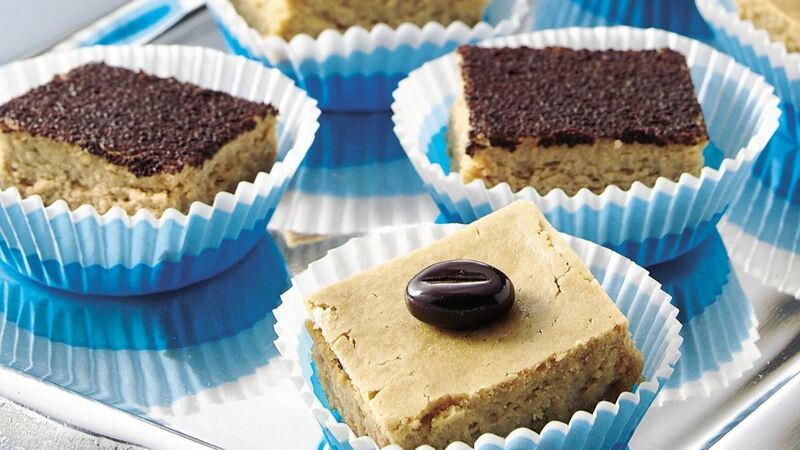 Sprinkle with grated chocolate or top with espresso beans. Refrigerate about 1 hour or until completely chilled. For servings, cut into 6 rows by 4 rows, using sharp knife dipped in water.